Five years ago, who would have thought we’d track our health with a watch, or that our phones could manage our home security? Who would have guessed that mobile devices could give us shopping advice or open the door for a whole new wave of media consumption? And who could have predicted that an entire generation will never own a docked computer or subscribe to a cable company? Five years go the mobile revolution was in its adolescence. Today, it’s in the midst of a serious growth spurt, and there’s no telling when it will stop. 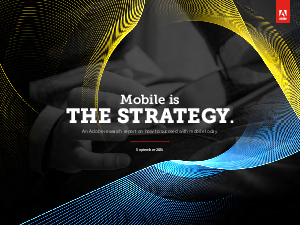 This study reveals how business are using mobile today.